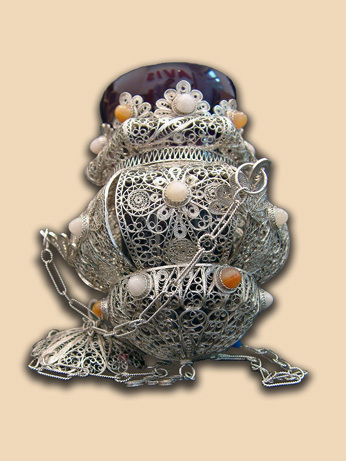 Icon silver filigree vigil lamp consisting of 6 elements, decorated with with brown and white jasper stones. The lamp is suspended on 3 chains. Material: silver 950, brown and white jasper. In possession of: His Grace Antonije, Bishop of Moravica, Serbian Orthodox Church.